On the first day of my visit, I went looking for Lokaahar, a new restaurant in Jodhpur Park I had been reading about. The place is deep inside Jodhpur Park area, and I had a little difficulty in finding it even with Google Maps. Like many other new restaurants in Kolkata, this place is located on the ground floor of a residential building, spread over three rooms. 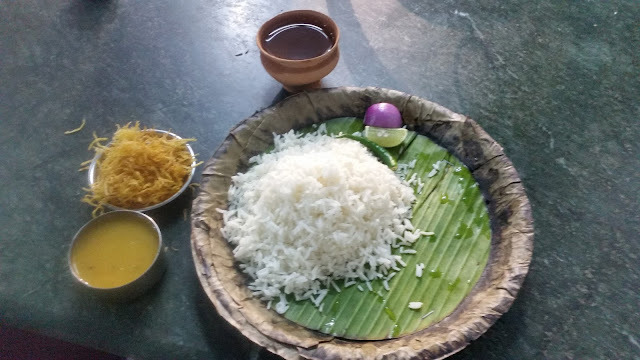 The restaurant is very tastefully decorated with artifacts from rural Bengal, and there is a small shop within the premises selling these too. As soon as I reached, I was informed by one of the owners that the restaurant has just won in the Best Discovery category of Times Food Awards. The staff looked extremely happy as this is quite an achievement for this one-year-old place. Since I was alone, I looked for plated meals in the menu and settled for the Mutton Thali (Rs 400). For the lone vegetarian dish in the thali I was given an option of Shukto or Mocha, and I went for the latter. The place has quite a few options for the standard Bengali meal, including vegetarian, egg, a variety of fishes as well as chicken. The food came within ten minutes, the time I spent in studying the menu. The Moong dal with Peas and Alu Bhaja were par for the course, but it was the ghee flavoured Mocha (banana flower) which was the dish of the day. The Mangsho (mutton) tasted good, but I would have liked a more runny gravy to go well with rice. The meal was complete with some Tomato Khejurer Chatni and Mishti Doi. A quick note about the service. Whenever I reached out to serve myself, the waiter popped up from nowhere to help me. Attentive but unobtrusive. The place is very interesting and warrants a second trip for the a-la-carte food. Chapor Ghanta, Bakphool Bhaja and Alu Bokhrar Chatni are a few things I plan to try on my next visit. 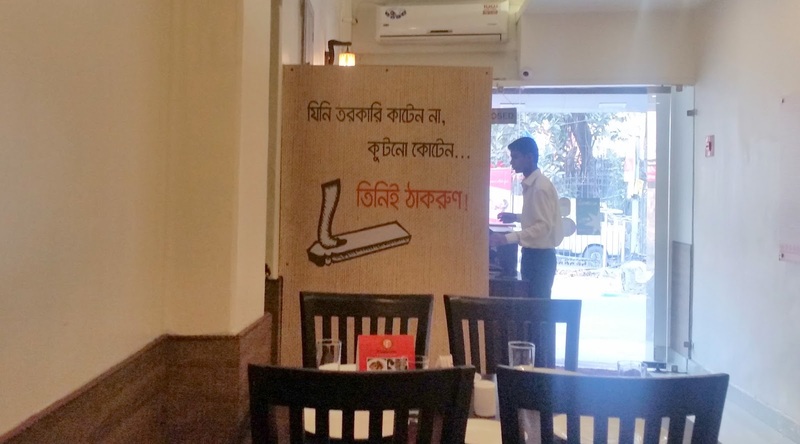 The second Bengali restaurant which I happened to visit a few days later was Thakroon, located inside a lane very near Gariahat crossing. 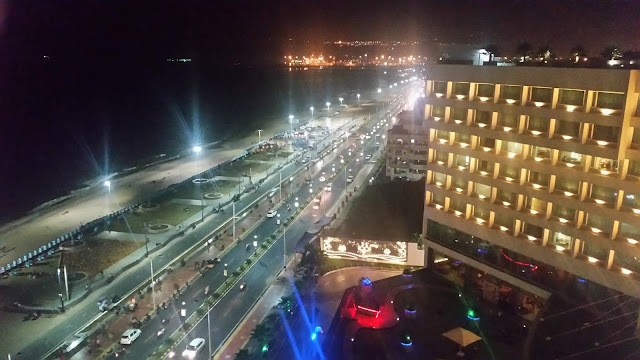 This was suggested by Sayantika Dutta of eatflybuymag.com. Also, since my arrival at Kolkata I have been seeing their banners on almost all lamp posts in the Gol Park Area saying that they serve the Bengali cuisine from the 18th century. This time it was not difficult to find the place which again is a part of a residential building. Décor was minimalistic, with a few interesting posters elaborating the concept of Thakroon. 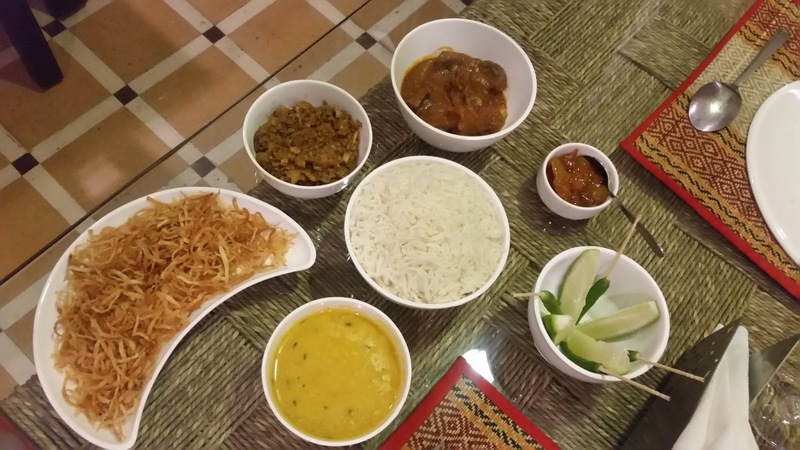 The menu went into depths of Bengali cuisine with items like Sil Bata Chingri, Teel Bata Mangsho etc, and the thali section had a Khichuri Thali priced at Rs 100. Another highlight of the menu was the thoughtful combos for a quick bite, stuff like Parota-Hansher Dimer Kalia, Luchi-Mangsho and Kachuri-Alur Dom. I wanted a full meal and opted for the Thakroon Mutton Thali (Rs 320 AI). It took quite long for the thali to appear and I continued with studying the menu. At last, after a couple of reminders, a very well presented platter made way to my table. The Thali had Moong Dal, Alu Bhaja, Dhyarosher (bhindi) torkari, Luchi and Mangsho. While the dal and potato fry were good, I was disappointed with the okra dish, where the masala was slightly burnt. Also, the mutton curry which tasted good, was confused whether it should be compatible with the rice or the luchis. They would do well do have a vegetable dish which goes well with the luchis in the platter and keeps the Mangsher Jhol for the rice. The otherwise satisfying meal ended with chutney and rasogolla. I had made up my mind to go back for the Khichuri Thali soon but unfortunately, could not take out time in the next few days. Will save that for my next visit to Kolkata. 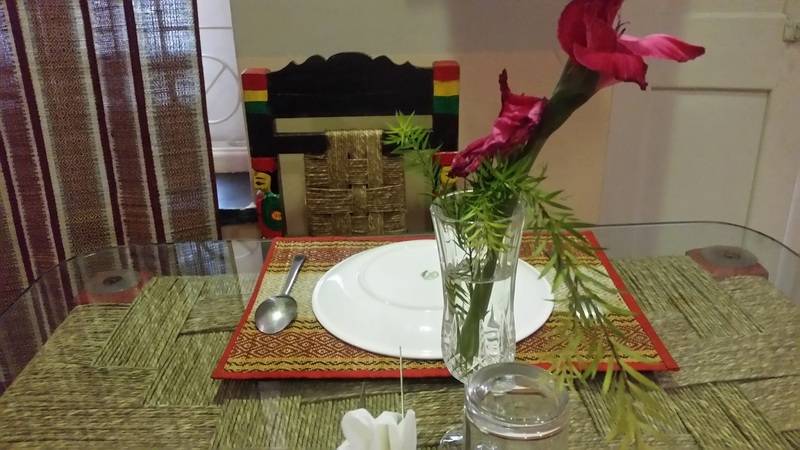 I had originally planned to only try new Bengali restaurants in the area, as I had already been to places like Tero Parbon, Bhojohori Manna, Kasturi and Sholoana Bangaliana. A chance meeting with Indrajit Lahiri of Moha-mushkil.com changed that. We went for a Kolkata Mughlai breakfast at Shiraz, and he suggested that I have lunch the next day at Adarsha Hindu Hotel, Gariahat. I had dined in the pice hotels (the name originates from the meals priced at a few paisas that these places used to serve many decades ago) of Gariahat during my college days and had some nice memories of the food there. So I decided to drop the “new” tag and landed up at this place on the first floor of Gariahat market. Nearing the place, you can hear the waiters calling out and inviting you to the restaurant, which reminded me of the restaurant in the novel of the same name by Bibhutibhushan. 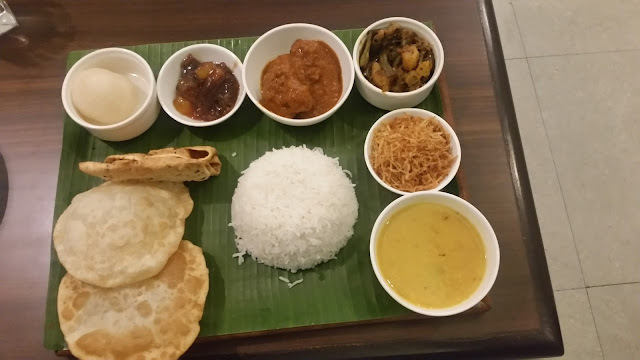 Adarsha Hindu Hotel (a.k.a Kalipada Maitir Hotel) is the Kolkata equivalent of the Andhra Messes of Hyderabad – a clean place with shared tables and extremely quick service. The basic meal served on plates covered by banana leaves consists of rice, dal and alu bhaja. Water is served in an earthen glass as was the fashion in marriages of yesteryears. Other items are as add-ons, with prices displayed prominently on a board. 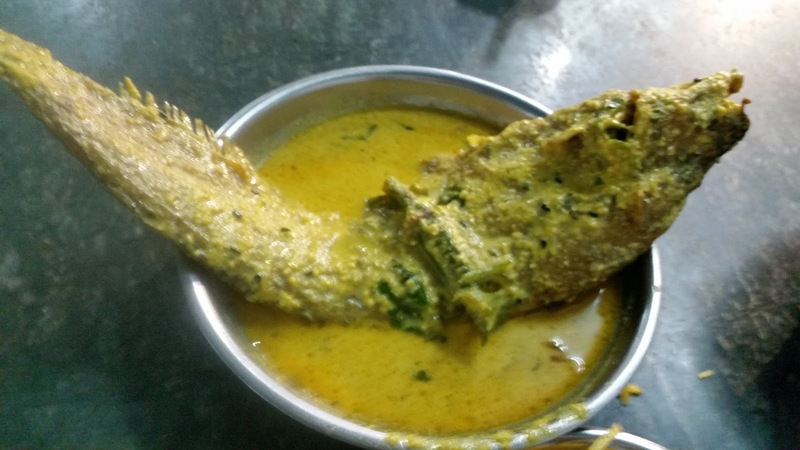 The prices are amazing – a quarter plate of mutton curry with four pieces costs Rs 80, and a huge Pabda Fish in mustard gravy was for Rs 120. 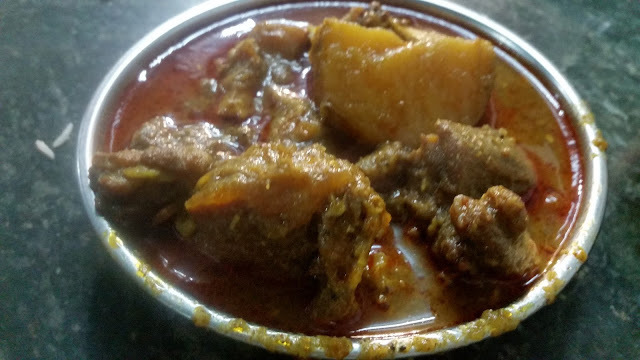 The Pabda Sorshe was extremely well prepared with the notes of mustard in the curry adequate but not overwhelming. The Mangsher Jhol was not at all spice-laden, the type that we enjoy at our home (patla jhol, as we call this version of the curry). The place has a huge choice of fish items – Bhetki, Aar, and Chitol among others, but I could not try some more from them as I was alone. The bill for the entire meal came to only Rs 222. A steady stream of people was continuously trooping in, sharing the tables, enjoying the meals quickly and moving out. It was interesting to see their communication methodology, the senior waiter rapidly shouts out all the orders table-wise with the manager at the cash counter noting it down. Based on my experience here, I made a mental note to bring my wife (a fish lover) here on our next trip and also to visit more pice hotels, especially some in Central Calcutta which I used to frequent decades ago. Adarsha Hindu Hotel is my favourite lunch joint.Thank you for a good write up.